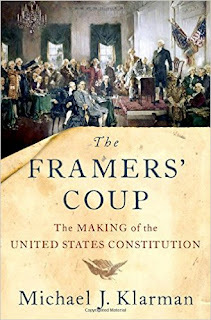 Here are the collected posts for our Balkinization symposium on Michael Klarman's new book, The Framers' Coup: The Making of the United States Constitution (Oxford University Press 2016). Sandy Levinson, Reflections on "Reflection and Choice" by "We the People"
Calvin Johnson, Why Our Constitution Should Not Be Adopted? ?